ElitePalaces Easter Egg Hunt 2018! Do you want to be part of the fun at our 3rd ElitePalaces Easter Egg Hunt event? 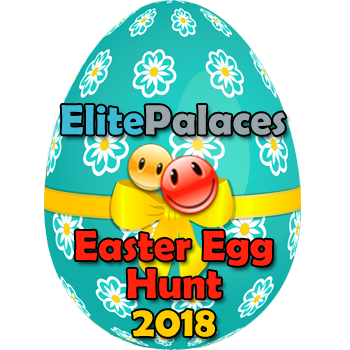 well is really easy, the hunt will be around different palaces hosted at ElitePalaces and there will be different prizes for the first 3 places, users that finish the event with more points with less time. This will be a really interactive event where all users can collect easter eggs but be careful! you can find spiders, bugs and other funny things that can rest you points! If you want to add your palace as part of the event to receive the players, you are welcome too! please check all the information at Our event web site! Previous PostELITEPALACES WINTER’S SNOW TOUR 2017!Next PostElitePalaces Easter Egg Hunt 2018 Winners! Information about our new scripts, the status of our servers and important messages. ElitePalaces Winter’s Snow Tour 2018! ElitePalaces Easter Egg Hunt 2018 Winners! ELITEPALACES WINTER’S SNOW TOUR 2017! ELITEPALACES HALLOWEEN TOUR 2017 WINNERS!!! ElitePalaces Easter Egg Hunt 2017! New Game: ElitePalaces Wheel of Fortune! Elitepalaces ElitePalaces hosting web site, Host your palace with us to get the best scripts and support! EliRadios ElitePalaces radio hosting web site, Host your showcast or edcast radio station with us! The Palace Portal Our public palace directory! PalaceChat4 PalaceChat4, our Palace client program with full color props, bigger rooms, amazing scripts and more! InspectorWordpress has prevented 233 attacks.